The town of Corfu was created in the 7th century BC by Corinthian colonists. It is located on the peninsula of Kanoni. Palaiopolis which was its centre expanded from Mon Repos to the village of Analypsis. To the east was the Port of Alkinoos (Garitsa Bay) and to the west was the Hyllaic Port (Lake Halikiopoulos). To its north it was extended by the Tower of Nerantzihas – the only part that remained from the ancient wall of the city, dating from the 6th century AD. Corfu has always been coveted by the European powers on the border between East and West. The successive western conquerors have left their mark both on its urban structure and its architectural style. In the destructive attack by the Goths under Totilas in the year 562 AD, some great barbarian raids took place that forced the inhabitants to take refuge elsewhere, and thus the new town of Corfu was created. 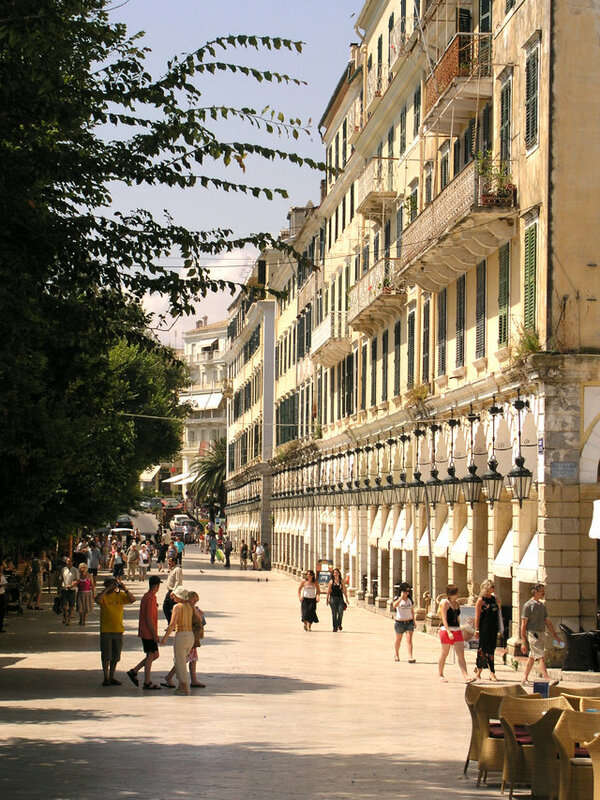 The main reference points for modern Corfu is the large Spianada Square, the commercial center and the Liston. One can spend many hours wandering through the narrow lanes. At the southern end of Garitsa Bay is the Kanoni Peninsula. There, the original city of the Phaeceans is said to have been built. The Ancient Temple of Artemis is to the north. It was built between 590 and 580 BC. The Palaiopolis estate remains intact. Palaiopolis formed the centre of the ancient city of Corfu. Today, still exist only a few remains of an ancient temple which was dedicated to Hera, otherwise known as Akraia. It was built around 600 BC, destroyed during the civil war that took place in 428 BC between the oligarchs and democrats, rebuilt in 400 BC, and destroyed in 30 BC by the Romans. The Temple of Kardaki is located a little further on. It was found accidentally by the British in 1822. It is a Doric style temple and is in a very good state of preservation. It is probably dedicated to Apollo. A causeway winds down to Kardaki from the village of Analypsis. It has a famous spring for which tradition says that a stranger who drinks from its water will forget his own home. The Town of Koryfo was constructed to the east of the present town. Stones and marble taken from the ruins of Palaiopolis were used for its construction. The ruins of the Palaiopolis Basilica, or Agia Kerkira are located close to the gate of the estate. They were built in the 5th century using materials from buildings on the site. Kanoni is a modern tourist resort with several hotels, and a view over the Halikiopoulos Lagoon and the airport. A tiny island is linked to the shore by a causeway. A number of boats moor on the causeway and will take you to Mouse Island (Pontikonissi). There, you can visit the Byzantine Church of Pantokrator. Kanoni is linked with Perama on the other shore by another causeway, for walkers or cyclists. Kampielo (Old Town) was founded around 1267-1386 when the residents of Koryfo were forced from overpopulation and pressure from the Catholic overlords, to build outside the walls. Thus the Historic Centre of Corfu Town was founded. The visitor can trip through its labyrinth of alleyways. The Church of the Blessed Virgin Antivouniotissa in the 15th century, it was built in Kampielo. It contains icons by Stefanos Tzagarolas of the Cretan School and Emmanuel Tzanes. The Byzantine Museum was established here in 1984. The Metropolitan Church of the Blessed Virgin of Spiliotissa located on the way out of Kampielo was built in 1577. The visitor can see, amongst other icons, works by Michael Damaskinos (16th century), Panayioti Paramythiotis (18th century) and Emmanuel Tzanes (17th century). The Church of the Blessed Virgin of Kremasti is located in a little square with a sculpted Venetian wellhead of the 16th century at its centre. There is a fine stone iconostasis and icons inside the church, painted in the Italian mode by Spiridon Sperantzas. The Church of Agios Nikolaos ton Geronton was built in the 16th century in Kampielo. The oldest priest (Gerontas) in Corfu would be in charge in this church. It proudly displays its important icons by Tzanes. The Church of Pantokrator, in Taxiarchis Square, has an iconostasis painted in the 18th century by Chrisoloras and works from an old iconostasis that was painted by Tzanes. The Old Fortress was built by the Venetians on top of the Byzantine walls and they completed it on two stages. 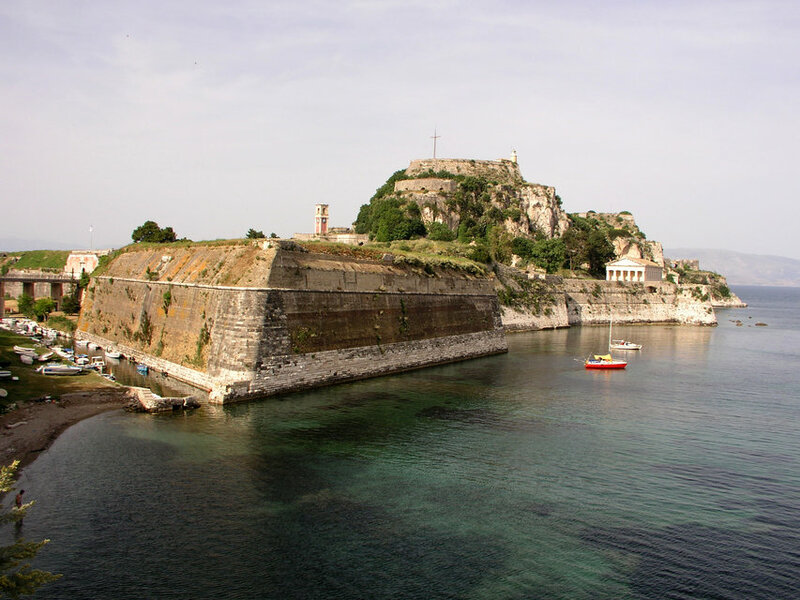 Between 1572 and 1645, the Italian architect F. Vitelli built the New Fortress constructed on the hill of Saint Mark. Later, the British built the internal buttresses. It consists of two large twin bastions and is regarded as a wonderful example of military design. The summit of the Fortress also is good to visit for the view over the rooftops of the Historic Centre and over the sea. It has been restored recently and now exhibitions, concerts and other cultural events take place there (contact the Municipal Information Office for information about the full programme of events). There is an exhibition centre in the left wing of the first floor showing distinguished exhibitions of sculpture, painting and photographs by artists of international renown. The church of Tenedos, a baroque-style church, stands next to the steps leading to the Fortress. It is dedicated to the Blessed Virgin of the Carmelites. It is a Roman Catholic church. Its construction begun in 1663, but it was not finished until a century later. The Town Walls link the two fortresses, and provided safety to the people of the town. Two other fortresses added to the defences of the town, one on Sotira Hill and one on Avrami Hill. The tunnels are the most impressive of the works of the Venetians era, which permitted underground communication between all parts of the town. These tunnels linked the four fortresses, central locations in the town, and also the islet of Vidos. Today some are closed off, either because of subsidence or for reconstruction. The Palace of Saint Michael and Saint George stand at the northern end of the Esplanade. The Palace, once a residence of the Greek royal family, was completely restored four years ago. The Esplanade is famed as the “most extensive square in the Balkans”. 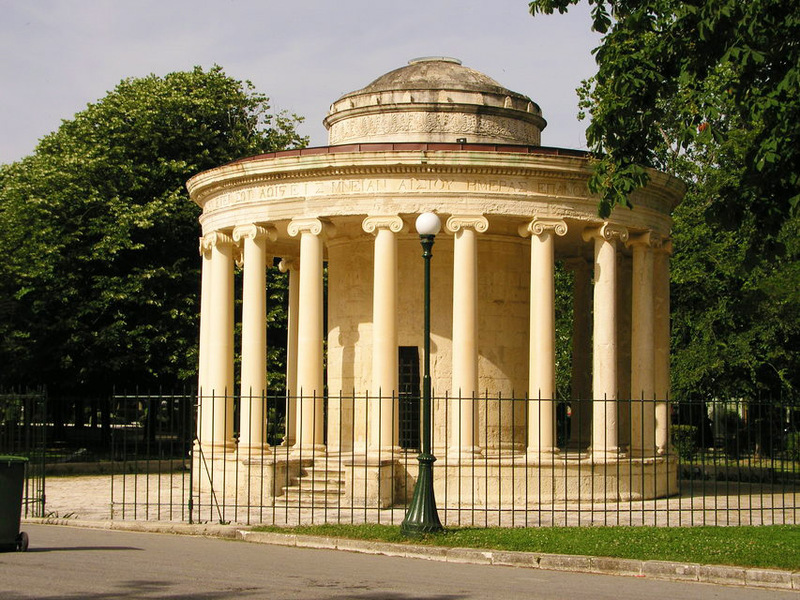 You can go to the Rotonda by walking around the square (built in Ionian style), a popular meeting point for young people, and the Bandstand. There you might see a band playing classical music or jazz. The bandstand is the place where people gather for the Midnight Mass on Easter Saturday. The Liston is a terrace which forms the western border of the Esplanade. It has a series of arches, and is a characteristic example of its era. Today many people meet in the Liston. The visitor can see the majorettes, parades by the philharmonic orchestras and religious processions. Pentofanaro divides the Esplanade square into its upper and lower areas. At the corner of the “Upper Esplanade” you will find the Municipal Tourist Information Kiosk, where you can purchase maps and tourist guides, obtain information about coming events, and change money. The Town Hall Square, was the most important meeting place to the town’s community during Venetian times. It became the first lyrical theatre in the East, in 1720. The Theatre San Giacomo entertained the Corfiots with remarkable performances of Italian opera for two centuries. In 1903 the theatre was moved elsewhere, another floor was added to the building, and it was opened as Town Hall. Its two main walls are decorated with various historical engravings, symbols and with stone masks. The Mourayia is one of the most beautiful neighbourhoods of the town, it is the first sight you see as the ferry sails in around the Old Fortress. Its official name is Arsenics Street, running from the Palace, on top of the old sea defenses, down to the Old Port. The Reading Society of Corfu is located on Arsenics Street and it is one of the oldest cultural organisation in modern Greece, it was founded in 1836. 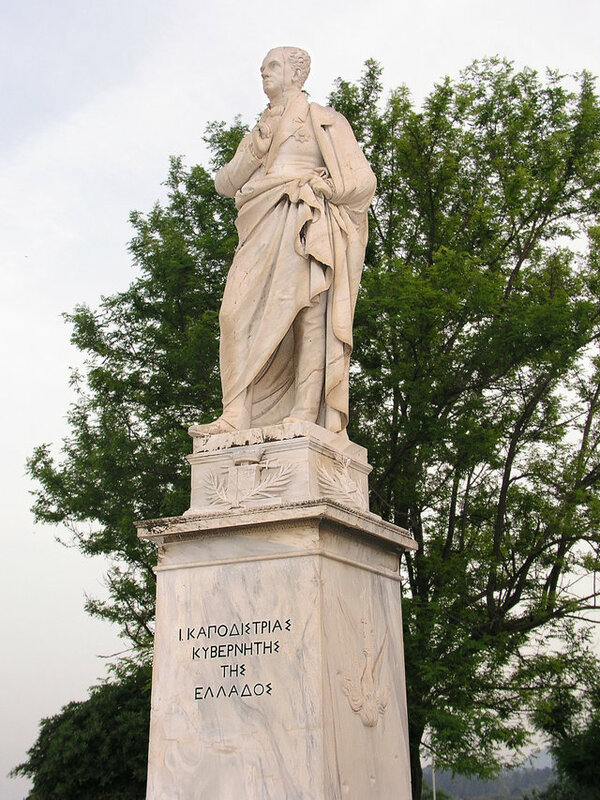 It had as members Kapodistrias, the poet Kalvos and other Ionian islanders. Opposite, below the level of the road, is one of the gates of the Old Town, Saint Nicholas Gate, which leads through to Faliraki. The Kapodistrias Mansion also is on Arsenios Street. The Kapodistrias family built it during the British Protectorate. The Old Port until a few years ago, was the departure point for ferries to the mainland, and there was a lot of traffic. Now only ferries for Paxos and the Diapontian Islands leave from here. Spilia (cave) is the area around the Port and to the south, and it got its name from the cave at the entry to the New Fortress. Ovriaki area is the old neighbourhood between Spilia and the Porta Reale. Here the Jews (Evraioi or Ovrioi) used to have their shops, and it retains its old style. The Church of Agios Antonis and Agios Andreas was built in the form of a basilica with cross vaults, at the end of the 14th century, and is one of the oldest and most interesting of all the island’s churches. Nikiforou Theotoki Street begins at Spilia and runs to the Liston. Previously it was the main shopping street of the town. There are churches, monuments and offices that accommodate philharmonic bands and share space with shops and emporiums. The “Square of the Saint” is the informal name of the Square of the Heroes of the Cypriot Struggle and in the summer is the favourite place of street artists from all over the world. 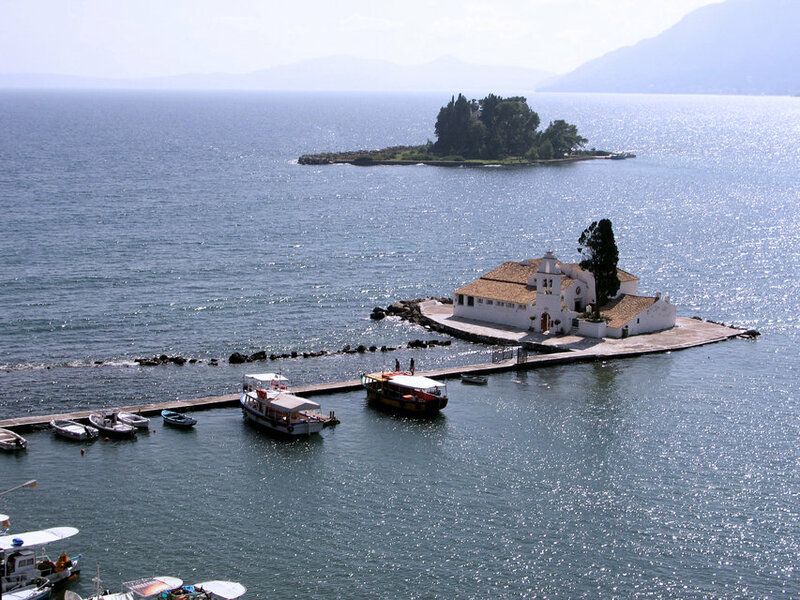 Three of Corfu’s most important churches are located here, the Church of the Blessed Virgin of Strangers, the Church of Agios Spiridon and the Church of Agios loannis (John the Baptist). The Church of the Blessed Virgin of Strangers (Panayia ton Xenon) is the name which was given to the Church of the Lady of Revelations (Panayia Phaneromeni). It was founded in 1689 by a Corfiot monk. Icons and frescoes by Nicholas Koutouris, Emmanuel Tzanes and George Samartzis exist in it, among others. The Church of Agios Spiridon was built in 1590 by the Voulgaris family. It has a very tall Venetian campanile. Inside hang several striking silver lamps, each with its own history. It became world famous for accommodating the relics of the miracle-working Saint Spiridon. The Church of Agios loannis (John the Baptist), one of the oldest church in the town (16th century), stands just opposite the Square. The Old Philharmonic Society is another site that one can visit in Corfu Town’s Historic Centre. The Old Philharmonic was created in 1840 by the people of Corfu. 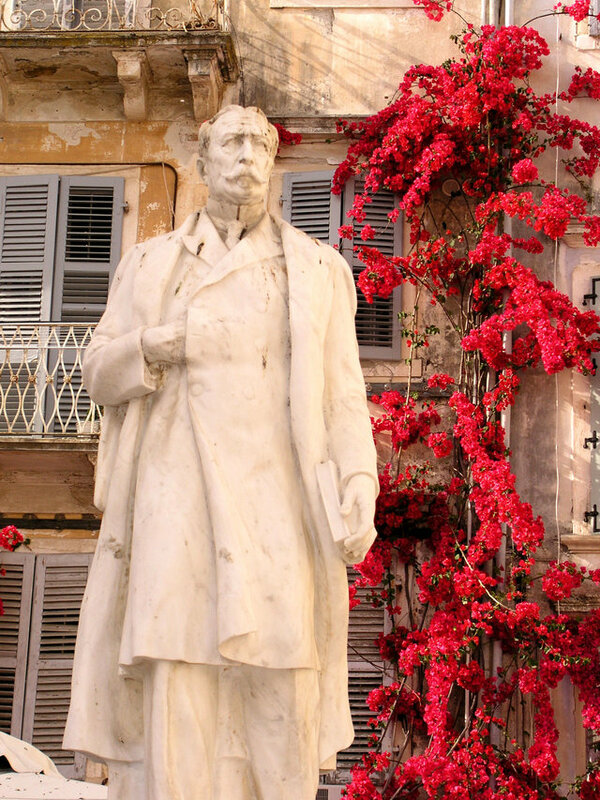 Nikolaos Mantzaros, the composer of the Greek National Anthem, was one of its most important founders. San Rocco comprises the new town of Corfu which grew up outside the walls. It is centred on San Rocco Square. The Monastery of Platytera, constructed in the 18th century has a large collection of works of the 17th century, by Klotzas, Tzanes, Poulakis, Kantounis and Koutouzis. Also the grave of John Kapodistrias and of Foto Tzavelas exist in it. Mandouki is one of the most historic neighbourhoods in Corfu. It is the area between Platytera and the port. It is a pretty neighbourhood, with an attractive sight of old houses, shops and good tavernas. The Archaeological Museum on Garitsa Bay is full with many interesting exchibits, (Gorgon Pediment is the most interesting, it is the oldest stone pediment ever to be uncovered in Greece). The Ionian Parliament, a neoclassical style building at the top of Moustoxidi Street, and the Ionian Academy, which in 1824 became the home of the first Greek university are two buildings worth visiting. The Tomb of Menecrates is close to the museum. It was discovered in 1843 and it bears engravings in the Corinthian alphabet. In the Church of Agios lasonas and Sosipatros the visitor can see wall frescoes dating from the time of its construction, as well as significant icons of the Cretan School by Emmanuel Tzanes and Michael Damaskinos. The church was built around the year 1000. Maybe the most attractive church in town – the church of Saint Spyridon – is dedicated to the island’s patron saint, Agios Spyridon . It was built in 1589 and houses his relics. It has the highest tower. Mouse Island (“Pontikonissi” in greek) is the small islet which has an ancient monastery. According to legend, Mouse Island was formed when Poseidon turned the ship that had taken Odysseus back to Ithaki, to stone.Museums.